This article is about Rock Crusher. You may be looking for Rock Cutter. 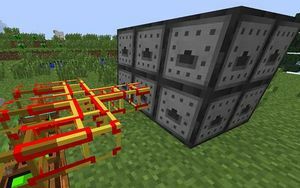 The Rock Crusher is 2x2x3 multiblock structure added by Railcraft, used to process various materials. The Crusher is built out of 12 special blocks made from a Block of Steel, Pistons, and Diamonds. If broken down, it takes 3 Blocks of Steel, 12 Pistons, and 12 Diamonds to build one Rock Crusher. Rock Crushers cannot be built adjacent to each other—there must be at least one tile in between Rock Crushers. The Crusher can be loaded and unloaded via Loaders or BuildCraft Pipes. The entire 3x2x2 structure is treated as a single block, similar to a large chest. It will accept input from the top and will output from any remaining side. If you have BuildCraft installed, the Rock Crusher will need to be powered via BuildCraft energy. The Crusher will draw 15 MJ of power while processing materials. If you have IndustrialCraft2 installed, the crusher will also be able to crush ores into dust just like a Macerator. The list of materials that can be processed includes just about any vanilla blocks made from stone or brick. Additionally, you can process Bones and Blaze Rods, also many of the materials have a small chance of creating bonus material but one of the most important products it can produce is Obsidian Dust. Obsidian Dust has a 25% chance of being produced when processing Obsidian in addition to producing Crushed Obsidian. Crushed Obsidian can be further processed directly into Obsidian Dust if you desire, but it also makes an excellent ballast material. Crushing Cobblestone produces Gravel and has a 7.5% chance to make Flint (although it is claimed that there is a 10% chance). Crushing Gravel produces Sand and has less than a 0.17% chance to also create Gold Nugget or Diamond. Rock Crusher has no known uses in crafting. This page was last modified on 31 January 2017, at 05:15.